As much as I hate wishing away any holiday time, this morning was the day I was most looking forward to. 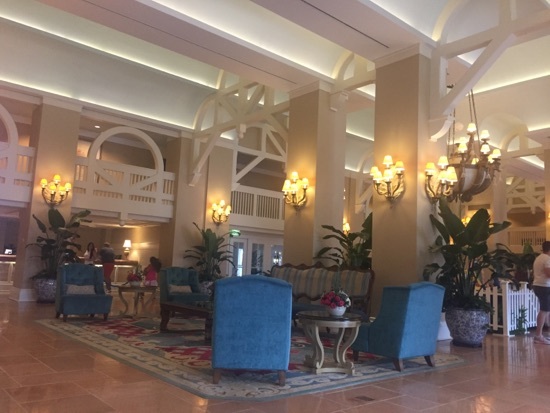 We were checking in to the beach club for a couple of nights, complete with deluxe dining plan. We'd packed up our stuff last night so this morning we just needed to get ready and make the short drive to the beach club. We arrived at 8.45 and checked in, our room was ready which was a great surprise and total bonus, the only downside it that our door lock is not recognising magic bands so we've been given key to the world cards which is quite a faff having to carry them around but quite cool as I never thought we'd get another one of these. We wandered over to our room in the villas section and it was stunning! The decor is beautiful and the room is plenty big enough for the 3 of us. 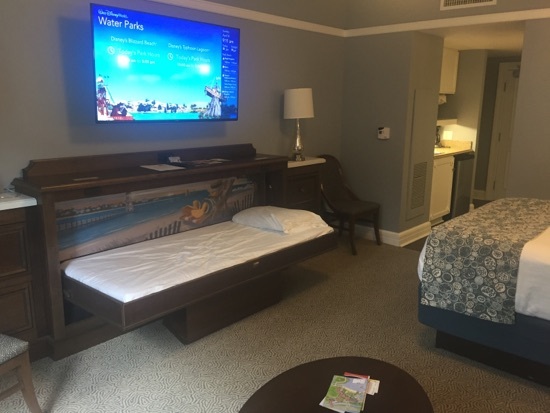 There's a pull down bed under the TV which Dd is thrilled about, she loved the one at the poly last year! We have a ground floor room with a small patio area in a really quiet corner of the resort, it's lovely. We usually would prefer a balcony but we're only here 2 nights so wouldn't have much use of it. After a quick look round our room it was time to head down to cape may cafe for our breakfast reservation. We checked in and were given a pager which went off about 5 minutes later. We were sat in one of the side rooms which was great as it meant we had plenty of space for photos with the characters without getting in anyone's way. 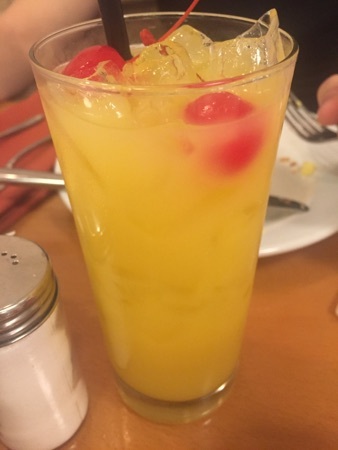 Our server came over and explained the buffet to us and we ordered our drinks. 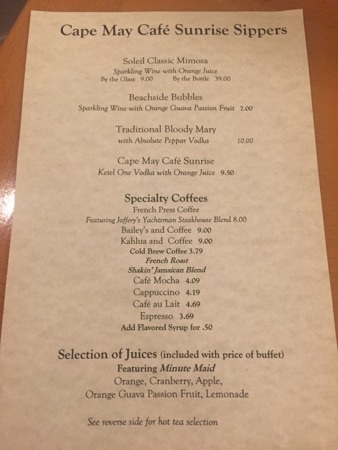 The dining plan now includes an alcoholic or speciality beverage. 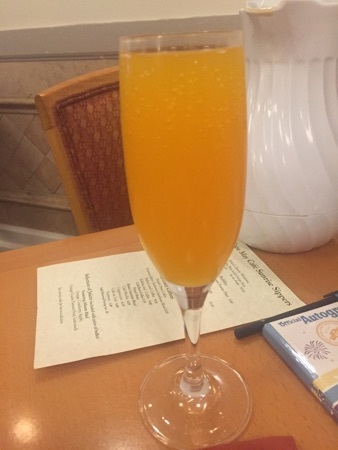 DH had a cape may cafe sunrise which was vodka and orange and was poured with a very generous hand! DD had an orange juice and DH was able to also have a coffee. 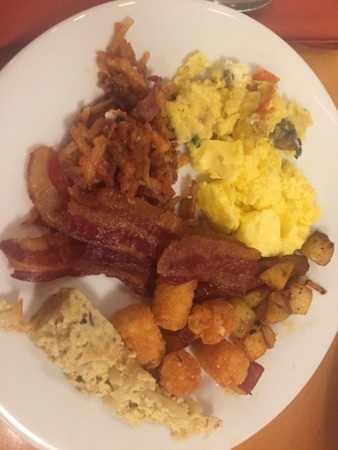 Our first trip to the buffet was for the hot food, I had scrambled eggs, crispy bacon, mushroom frittata, corned beef hash, breakfast potatoes and tater tots. 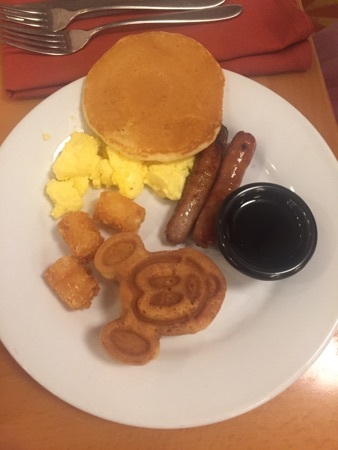 DH's was pretty much the same and Dd had a Mickey waffle, sausages, scrambled egg, tater tots, pancake and maple syrup. The food was all really lovely especially the goats cheese scrambled eggs. 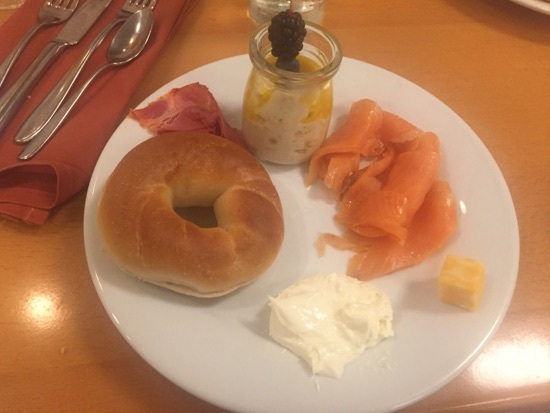 Next up I had a bagel with smoked salmon and cream cheese and a soaked oats pot topped with passion fruit and berries: the bagel was really good but the oats were pretty disgusting, I could barely swallow the mouthful I had they were so bad. 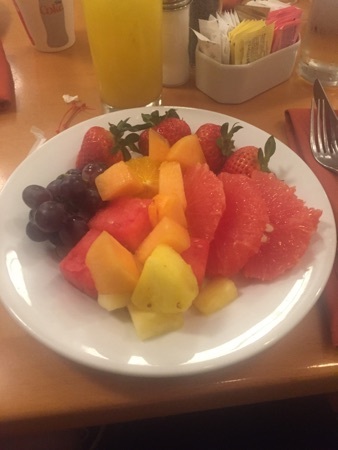 DH got a plateful if fruit which he said was really tasty, sometimes we find Florida fruit quite bland and tasteless, but not this. 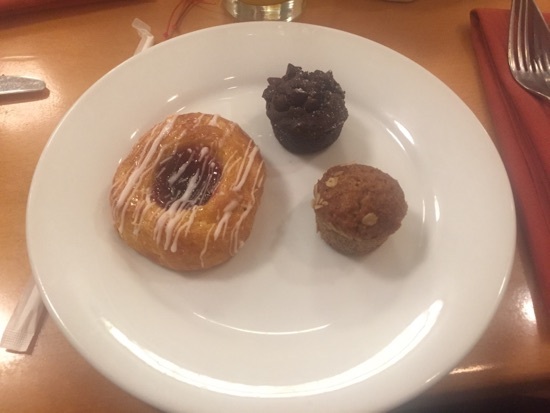 He also tried some of the pastries and said they were also really good especially the fruit danish. 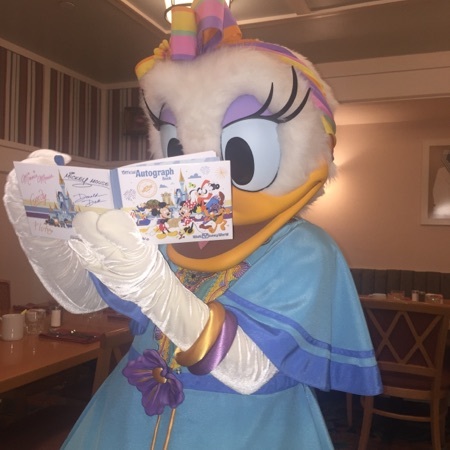 We were visited by all 4 characters, daisy, Donald, Minnie and goofy and Donald ever stopped by a second time, the character interaction was really good, they all spent quite a while dancing and paint with DD except Minnie who seemed to be in a bit of a rush. The buffet was $32 for adults and $19 for children. 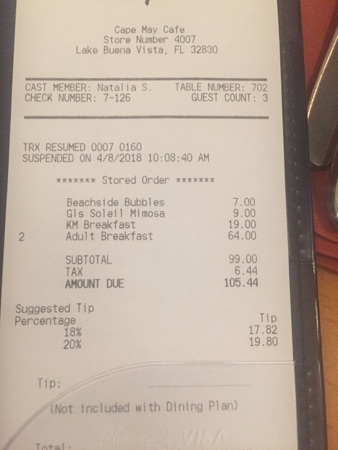 Our total including drinks came to $105.44 and we paid using 3 dining credits. We left cape may cafe and returned to our room via the beach club market place to pick up our refillable mugs, we won't get a huge amount of use from them but they'll be good for grabbing drinks at the pool. The beach club market place has coke freestyle machines which I love as you can get all sorts of weird combinations of drinks. We got changed into our swimming stuff and headed to stormalong bay, one of the main attractions of staying at this resort. It was quite an overcast day but still quite warm which was pretty good weather for a pool day. We spent a good 4 hours in the pool area. The slide was really good fun, only downside is it's abit of a trek up to the top across the path by the lake. We enjoyed the lazy river and I was surprised how deep it was in places. The pool didn't seem that busy today probably due to the overcast/cooler weather. 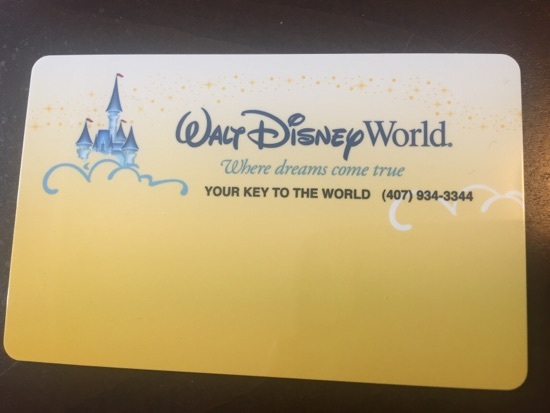 We left the pool at 3.30 and went back to our room to get showered and changed for our dinner reservation at California grill, then headed to the bus stop to catch a bus to magic kingdom. The bus arrived less than 5 minutes after we got there and true journey to magic kingdom took around 15 minutes. From there we took the resort monorail to the contemporary and arrived about 10'minutes early for our 5.20pm reservation. 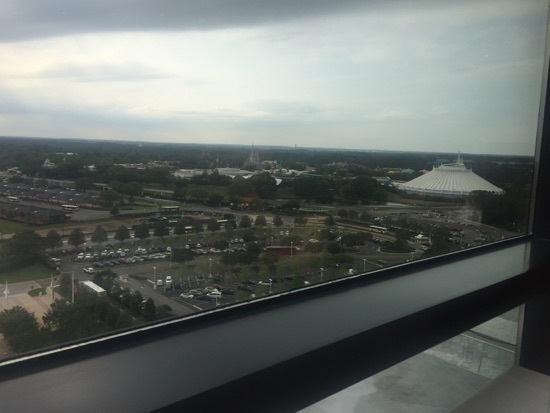 We checked in and were taken up to the restaurant on the 16th floor and seated almost immediately at a lovely window table over looking seven seas lagoon. 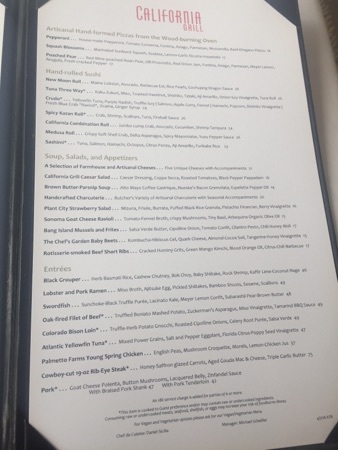 Our server came over and my one criticism so far is neither server have asked if we are on the dining plan or offered any advice as to what is and is not included. 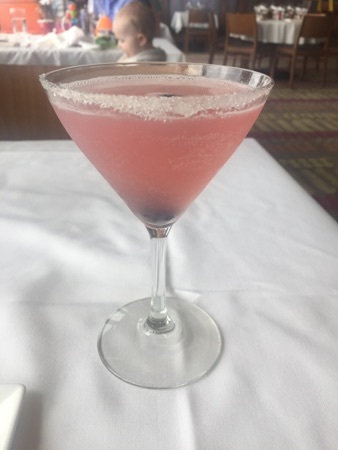 We ordered our drinks after looking through the menu, I had a blueberry lime martini ($13), this was really good and quite strong, our server also gave us a large glass of water with our alcoholic drinks which was very welcome. 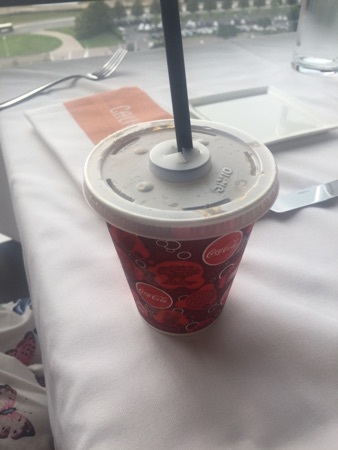 DH ordered a glass of cloudy bay Pinot noir which was $19 and DD had a coke. 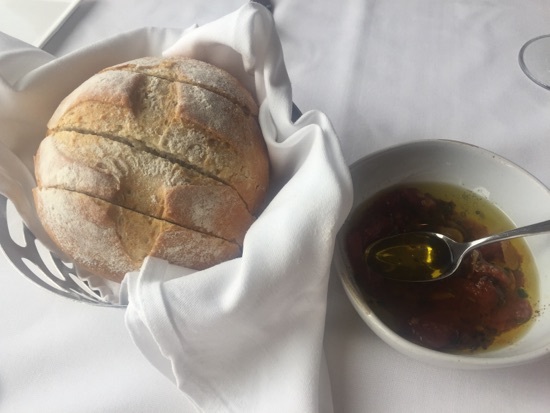 Our server brought us a bread service which was served with a sub tried tomato and garlic oil which was lovely with the bread. For starters DH and I ordered the spicy Kazan roll sushi, oh my goodness this is absolutely Devine! 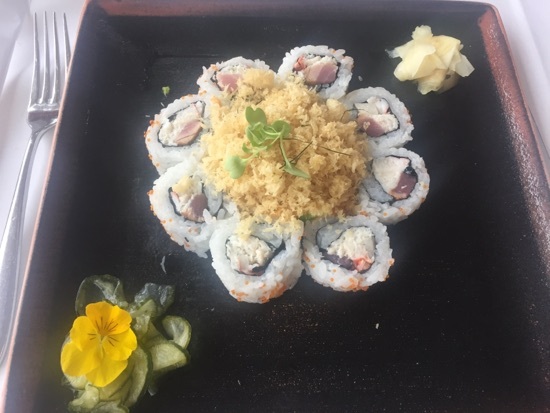 The sushi has crab, tuna and shrimp in the roll and in the middle of the plate are bay scallops in fireball sauce and topped with a crispy topping. I ate every single bite of this, the fireball sauce is quite spicy but perfect with the sushi. I could eat this all day, it's the absolute best sushi I've ever tasted. DH agreed that the sushi was outstanding but we couldn't tempt DD to try it. For our mains I ordered the oak fired fillet of beef this was served with mashed potatoes, asparagus and tamarind bbq sauce. This too was absolutely delicious, I had it cooked medium rare and it was perfect, every mouthful was so good! The mashed potatoes were so light and creamy, the asparagus was really tasty in a lovely dressing and the bbq sauce wasn't really like bbq sauce it was just a lovely accompaniment, there was absolutely no fat in sight on the meat. DH had the cowboy cut 19oz rib eye steak. 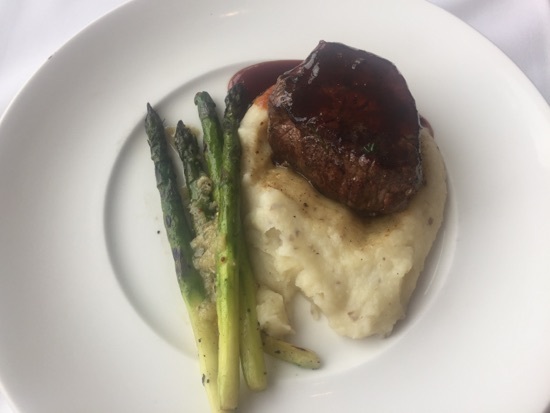 DH enjoyed this but was disappointed that the filet of beef wasn't the one he had a couple of years ago and was looking forward to that so this was never going to live up to them standards. 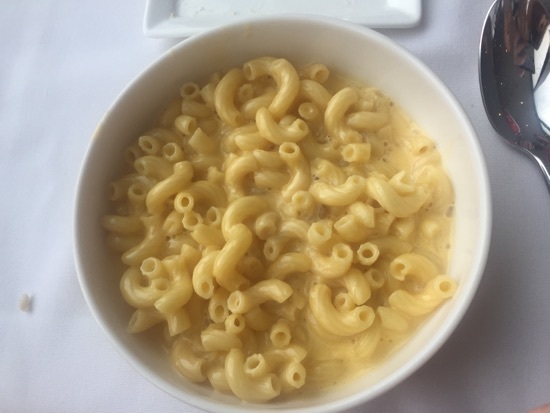 It came with Mac cheese which he said was very good. Dd had the kids macaroni cheese and said it was good. For dessert DH and I had the warm valrohna chocolate cake served with vanilla bean ice cream, milk chocolate whipped panna cotta, cashew clusters, we both thought this was really good, the chocolate cake had a molten centre and was really rich and gooey. 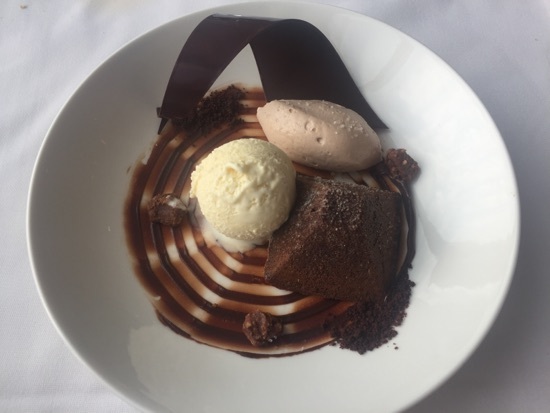 The chocolate Panna cotta was topped with sea salt and tasted lovely and the ice cream was just ice cream really, not bad but nothing fancy. There was a chocolate curl on the plate for decoration too which looked really impressive. 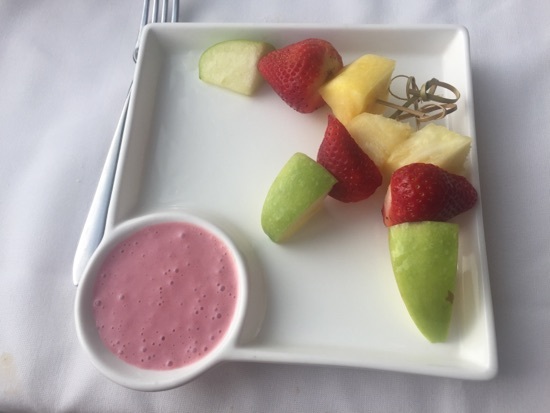 Dd had the fruit kabobs, strawberry, pineapple and apple on sticks served with strawberry yoghurt to dip in, she loved this especially the yoghurt. 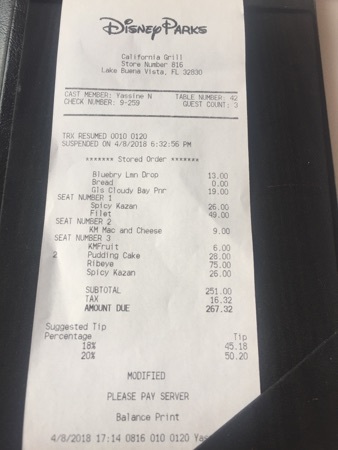 Our meal came to a total of $267.32 most of which was covered by the dining plan, we used 4 credits for DH and I's food and paid the $15 plus tax for DDs food. 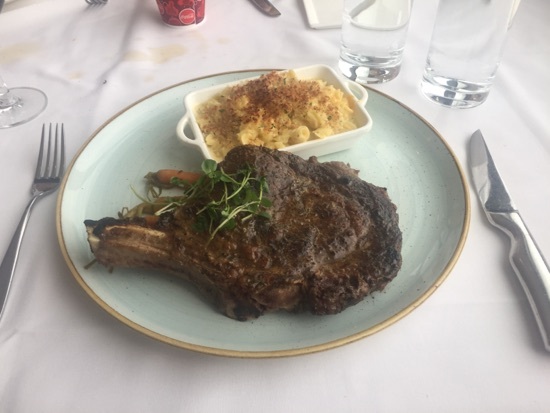 This has been the best meal I have ever eaten in my whole 32 years without exaggeration, every bite was faultless and I think California grill will be on our agenda for our summer trip. 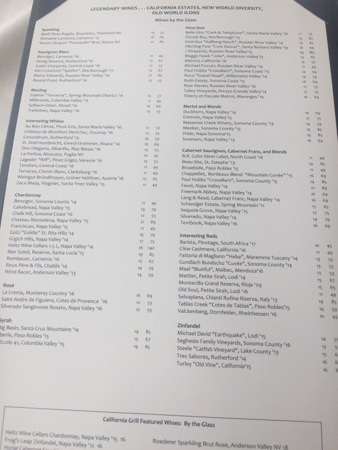 Here's the current menu for anyone interested. We left around 7pm and got the monorails to epcot. Here DD spent some time in the playground that they've erected for the flower and garden festival near the world showcase entrance, this closed about 8pm so we walked round the world showcase and headed into l'artisan des glances for an ice cream for DD. 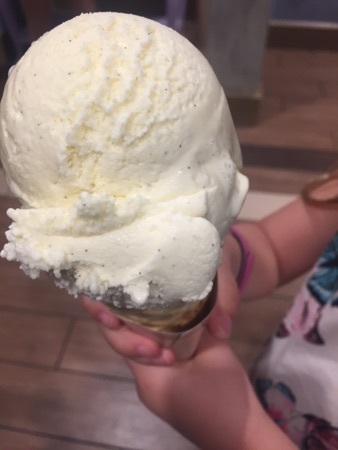 She got a single scoop cone with vanilla ice cream which should have been $4.69 but we used one of our snack credits. While Dd enjoyed her ice cream we carried on round to Germany where DH and I got a schofferhofer grapefruit beer, I've heard rave reviews of this and wanted to try one for a while. 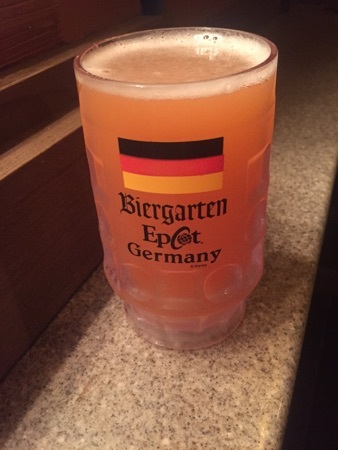 We got one in a regular cup ($8.50) and one in the souvenir stein ($12.50), the stein is just a plastic glass but will go alongside my glass from the rose and crown I got a few years ago and still got plenty of use out of at home. I really enjoyed the beer and DH thought it was pretty good too. 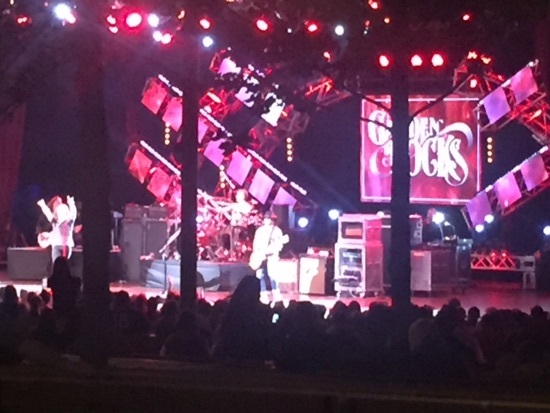 New Photo Added by missdopey - 9 Apr 18 3:55 AM. Look's like another fab day! I’ve been so looking forward to your Beach Club days, it looks like everything I’m hoping for. A brilliant day. What a lovely day with some great meals. Your room looks very nice. Another great day, with some really fantastic food. 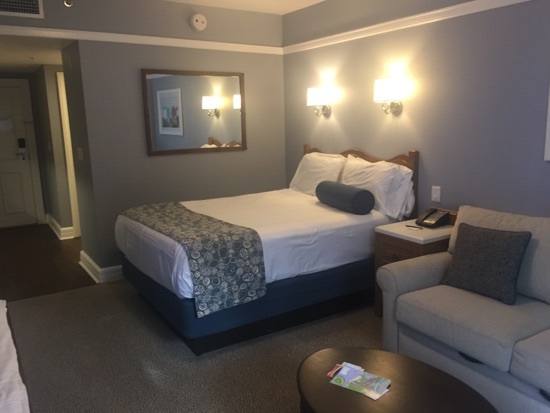 The room looks lovely at The Beach Club. Definitely want one of those ice creams - looks delicious.